L'Engle, Madeleine (2001). Carole F Chase, ed. Madeleine L'Engle Herself: Reflections on a Writing Life. ISBN 0-87788-157-X. ^ In a 2004 New Yorker profile of the writer, relatives of L'Engle disputed the mustard gas story, stating instead that Camp's illness was caused by alcoholism. Zarin, Cynthia (12 April 2004). "The Storyteller". The New Yorker. Retrieved 14 February 2012. ^ "Learn About Madeleine L'Engle, Beloved Author of A Wrinkle in Time". 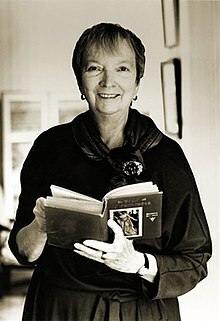 Madeleine L'Engle. Retrieved 2018-03-28. ^ "Becoming Madeleine Book Launch Information". Madeleine L'Engle. 2018-01-19. Retrieved 2018-03-28. ^ "Why A Wrinkle in Time Will Change Hollywood". TIME.com. Retrieved 2018-03-28. ^ "SLJ's Top 100 Children's Novels" (PDF). School Library Journal (poster presentation of reader poll results). Fuse #8. Aug 2012. Archived from the original (PDF) on January 5, 2014. Retrieved June 19, 2013.